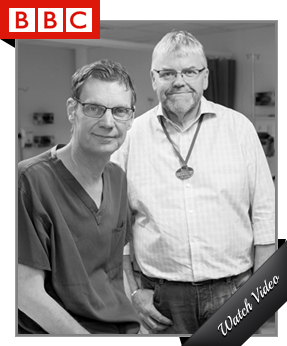 Home // News » The Banded Gastric Bypass – Is it an improvement on the traditional bypass? 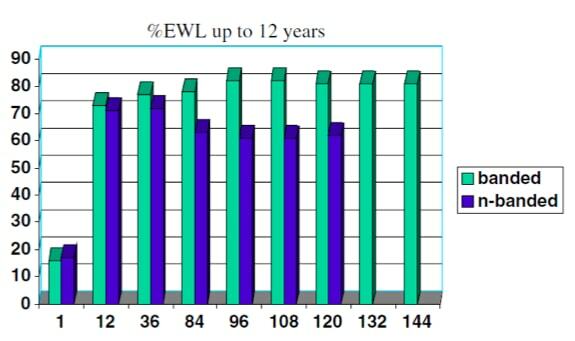 On average patients will lose 75% of their excess weight. The weight loss is seamless and easy because the procedure works to switch off the normal appetite response that is seen during dieting. Therefore weight loss is accompanied by a blunted appetite and not a voracious appetite. However, some studies that looked at the outcome of the gastric bypass in the long term, ie after 5 or 10 years, have reported that a proportion of patients, maybe 10-20% of them, report a slow and inexorable weight regain. Many of the older American surgeons who have been performing gastirc bypass surgery for 20 years will concur with these studies. They will say that appetite returns to normal levels and that patients report being able to eat much larger volumes of food in one sitting. These factors, allied with patients reverting to old bad eating habits lead to weight regain. 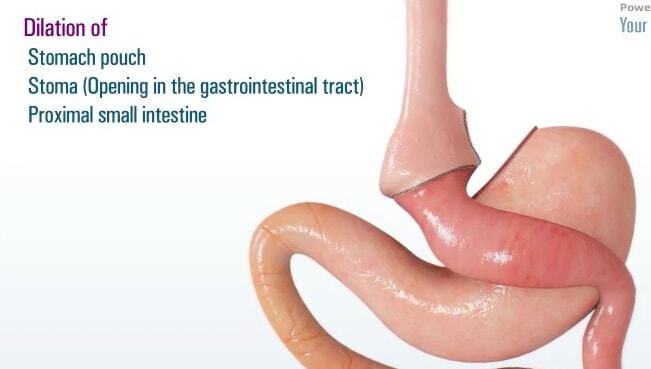 Therefore the gastric bypass for all its impressive results in most patients does have a potential weakness in the long term. A new development in the bypass aims to prevent long term weight regain by ensuring that the restriction to eating too much too fast is maintained. The procedure is called the banded gastric bypass. It is a simple addition to the bypass procedure and taked only a few minutes longer of operation time and confers minimal risk. The surgeon will place a small ring or band around the top of the stomach pouch (see figure). The ring is designed to sit comfortably around the small new stomach without causing any compression. Therefore in the short term a patient with a ring will have exactly the same felling of restriction as a patient without a ring. The message is it is not restrictive. 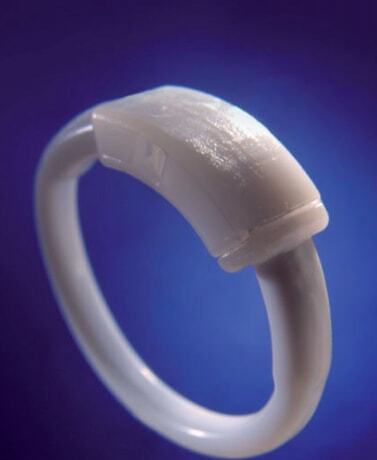 The ring will start to work only in those patients who are at risk of regaining weight. These are patients who typically would have been quite big before surgery, typically BMI greater than 50kg/m2. Once appetite returns and the honeymoon period of weight loss is over some patients start trying to overeat again. At first food may get partially stuck and things may be uncomfortable. However if this behaviour is continued then eventually the small stomach and the opening between the stomach and intestine will stretch. Over time the whole of the upper stomach can dilate up to be able to accommodate a large volume of food in a short time. The designer of the first ring, an American surgeon called Mal Fobi, calls this the ‘hot dog stomach’ because these patients can consume a hot dog in a couple of minutes. It is only in these patients who attempt to overeat that the ring has an effect. By sitting as a guard around the stomach. Not compressing it but preventing stretching and long term stomach dilation. 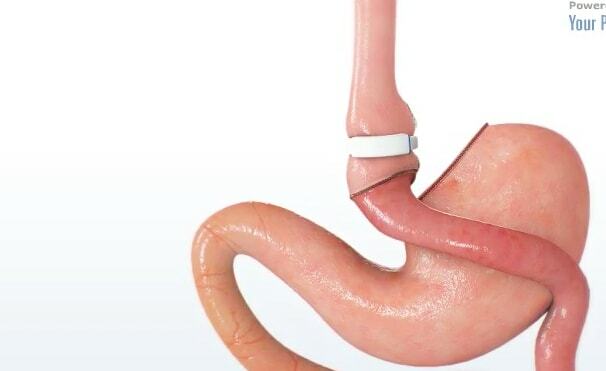 Results for studies comparing banded gastric bypass to standard gastric bypass do indeed show that there is a real and significant improvement in long term outcome with the ring band. I really like the gastric bypass as a procedure. It tick all of the right boxes. Great weight loss, change in appetite, resolution of diabetes, change in food preferences etc etc, the list goes on. However it does have this one potential weakness of long term weight regain in some patients. It is for this reason that I will be offering the banded bypass, also known as the Fobi ring, to patients in London who I think may benefit from this small improvement on a great procedure.